Happy Birthday to me! 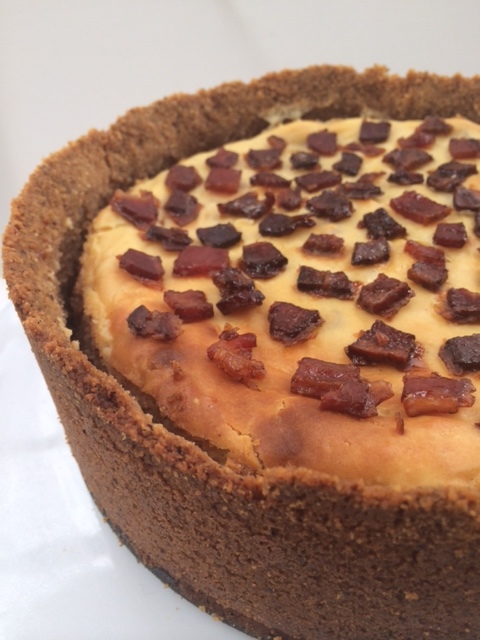 I decided to make myself a cake resembling a pizza/cheese and bacon roll this year. Although, it was not my first intention, I’m quite happy with how it looks, it’s a little rustic, not the prettiest, but it tastes good 😉 I was very excited about this cake, as it was something I had in my mind for a while, and I thought, what better occasion to make it than my own birthday! 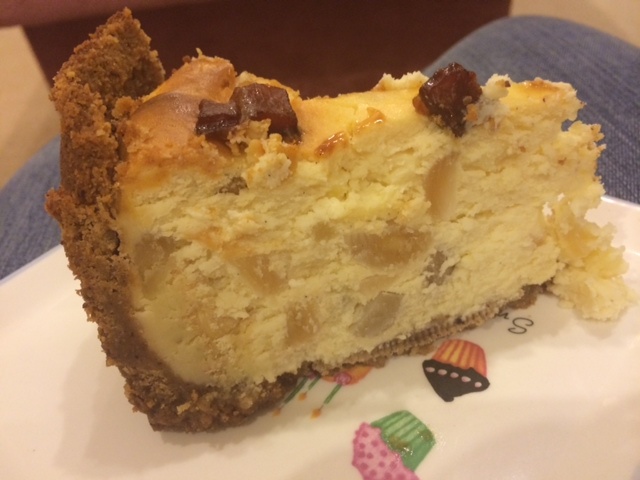 I am a very big fan of baked cheesecakes, and I have made a few in my time, but the only thing that puts me off baking them more often is that they are time consuming, and soooo expensive. Especially when you put a big packet of macadamias in it, and real maple syrup, which costs a small fortune on its own. Nonetheless, it was very delicious. I have used this recipe before to make a raspberry and white chocolate cheesecake, and it’s really great. You can play around with flavours, too, which is always good. 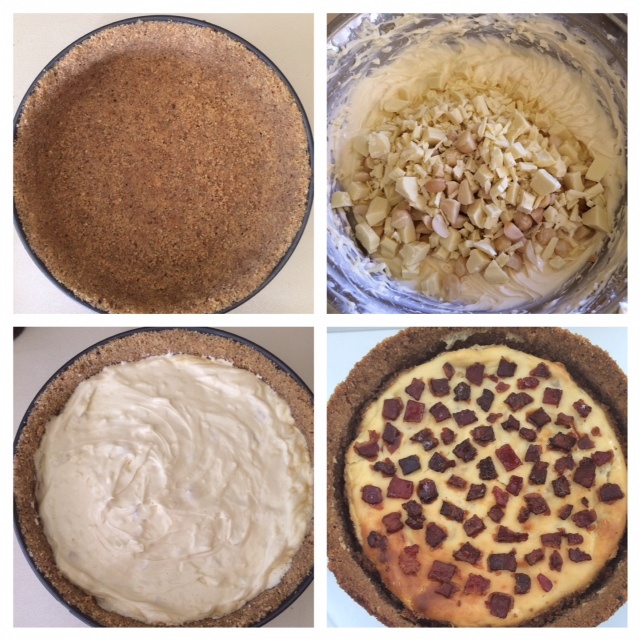 Aside from the cheesecake itself, I kind of made the other bits up in my head, which is a sure fire sign of a great recipe! Grease 22cm springform baking tin with butter. Use a food processor to crush biscuits until they resemble fine crumbs. Add the hazelnut meal and melted butter and process until all well combined. Place mixture into prepared tin, and spread evenly. You can use a straight sided glass to evenly spread the base mixture evenly around tin. Cover with cling wrap and place in refrigerator for 30 minutes. If you are not using base straight away, just make sure you take it out 30-40 minutes prior to baking. Preheat oven to 160c. Beat cream cheese, sugar and vanilla together until well combined and smooth. Add the eggs, one at a time, and mix until each is well incorporated. Using a wooden spoon, gently stir in the white chocolate, macadamias and 1/4 cup maple syrup. Pour mixture into prepared tin, and bake for 1 hour, or until just set in the centre. For me, 1 hour was perfect, but you can wobble the tin a little to test if the cake is cooked throughout. For 2 hours, leave the cheesecake in the oven, with the door ajar. I just a wooden spoon to keep the door open. This will prevent the top of the cheesecake from cracking. Place bacon and 1/3 cup maple syrup in a bowl together and mix until well coated. Spread evenly on an oven tray lined with non-stick baking paper, and bake for approximately 20 minutes on 180c, or until bacon is crispy and sticky. 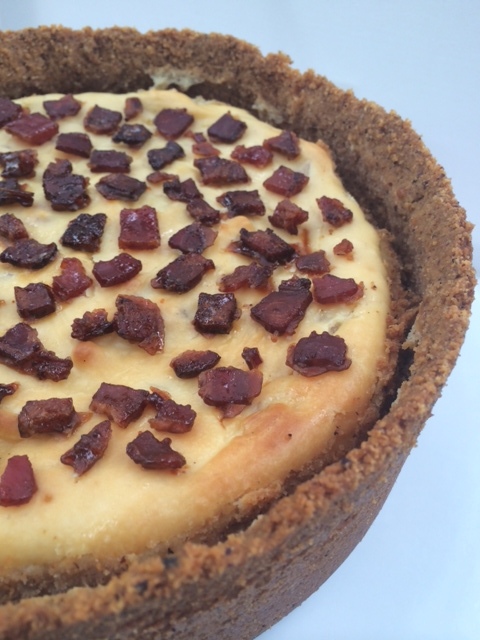 Let bacon cool on tray, then spread across the top of the cheesecake. If not serving the cheesecake straight away, ensure it is stored in the rerigerator, and brought down to room temperature to eat. If the cake is still cold, it is a nightmare to cut – I made this mistake!